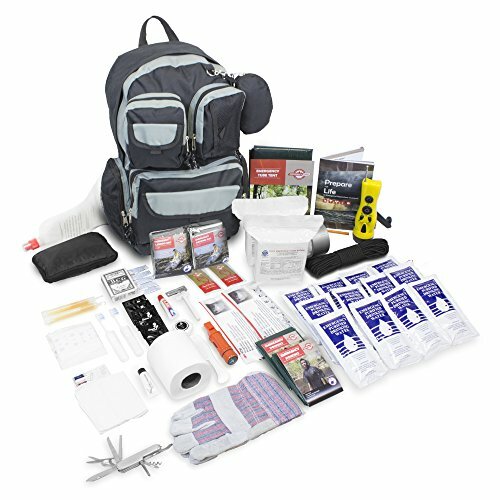 Getting a bug out bag ready to be used at any moment should be one of your first steps if you are serious about being prepared for an emergency. A premade bug out bag is thus a good option if you are just starting out with prepping. Disasters and other types of emergency situations cannot be controlled, prevented, or stopped; they will happen no matter if we like it or not. The only thing we can do in this situation is to educate ourselves and the people around us, and always be prepared. So, to make sure that you and your dear ones stay safe and prepared, we'll review and show you the best premade bug out bags available on the market. What is an Everyday Kit or Gear? 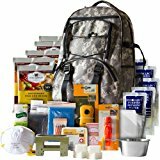 What is a Get Home Bug Out Bag? 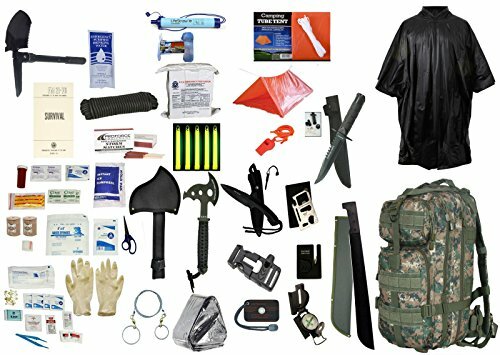 What is a 72-hour or 3-day Bug Out Bag? 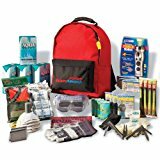 The Emergency Zone 840-2 Urban Survival Bug Out Bag Emergency Disaster Kit is an excellent bug out bag. Discrete color, lightweight, and packed with what you need for survival. The items are well organized inside waterproof bags and you still have space to add some extras you might want. With versions for 2 or 4 people, this is our favorite pre-packed bug out bag. 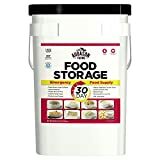 While the items in each bag may differ in importance and what you need depending on a situation, the general idea is to keep the most basic and most important items that will help you and your family survive before, during, and after a disaster. Your knowledge or familiarity with emergency preparedness will go a long way, so make sure to keep yourself up to date. For the convenience of individuals, families, and communities around the world, there are premade or pre-packed bug out bags sold on the market. Below are some of the best ones for your reference. In times of an emergency or evacuation, it is important to be one with the crowd or to blend in and avoid drawing attention to your emergency supplies; you need to be concerned about your safety and possibly your family or other people with you. This requirement is something that the Urban Survival Bug Out Bag can provide you. To go unnoticed, it was designed to appear like a regular bag or backpack that can help you blend with the crowd during an evacuation. The Urban Survival Bug Out Bag comes in black to better blend and look like a regular, nondescript bag. The Urban Survival Bug Out Bag can keep items good for 2 individuals; its contents are expected to help them survive a disaster for 72 hours or 3 days. If used by a single person, the supplies inside this bug out bag can last up to 6 days or 144 hours. This bag is the recommended kit to keep at work, in your car or at home, so you have something to grab when the situation calls for it. This bag is expected to be readily available to ensure you and your family’s survival during an emergency. This bug out bag is offered by a company called Wise Company. This company believes that disasters can happen anywhere, anytime and it can affect anyone. And it is true. Because of that, it is important to prepare yourself and those around you; you need to have supplies that will help you survive should a disaster strike. You need food, water, and other supplies; this is what Wise Company has envisioned since the company was built. Since then, Wise Company has been offering its consumers with emergency and survival packages that will help an individual, family, or a community face the truth a disaster can bring. During an emergency or when a disaster hits, you can count on Wise Company to be with you all the way. Their survival and emergency packages will help you safely and conveniently get through the situation. Their food packages are known to have longer storage life and can still be consumed safely. This is ideal as we do not know when a calamity would strike. Aside from longer storage life, Wise company also offers food packages that are healthy and can be prepared immediately by adding water. They have a line of ready-made and relatively affordable food packages that are ideal when an individual is in an emergency or disaster-hit situation. They provide high-quality emergency preparedness and survival supplies for you, your family, and entire communities. 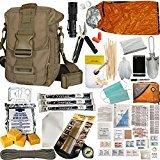 This 3-day survival and emergency bug out bag package for 2 persons is a quality product of Ultimate Arms Gear. 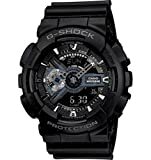 This company is known to be the leader when it comes to sporting or tactical gear. Ultimate Arms Gear brings with it 25 years of business experience in offering premiere-quality defense supplies on the market today. The company’s vision is to keep everyone aware of ultimate survival strategies and emergency preparedness. Ultimate Arms Gear is indeed the company to look to when it comes to emergency preparedness or disaster readiness. The survival and emergency readiness supplies offered by Ultimate Arms Gear including the 2-person supply 3-day emergency bug out S.O.S. food rations are available on the market at a very affordable rate. This product is made and offered by First My Family. It contains emergency readiness and first aid supplies that will last for 72 hours, or 3 days. This company, like other disaster readiness companies, promotes awareness and readiness for an emergency or a disaster. First My Family is a family-owned business which envisions making individuals, families, and the community 100% prepared for any unforeseen events that could happen. 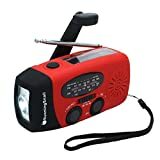 The company offers survival and emergency gear, first aid supplies, and other life-saving items that will help you, your family, and the people around you survive a calamity or any type of emergency situation. The emergency kit that they have for 4 persons is a high-quality kit which contains survival and emergency supplies that will last up to 72 hours, or 3 days. The contents are stored in a backpack made of high-quality materials. The bag includes enough food and water, first aid and emergency supplies, and other survival tools for 4 people. The supplies are approved by the US Coast Guard and have exceeded the highest criteria of emergency readiness advocated by the Red Cross. Another name in emergency preparedness kits or packages is Ready America. 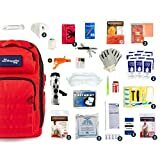 The Ready America 70385 Deluxe Emergency Kit 4 Person Backpack is one of the emergency packages they offer. 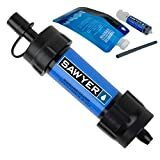 It contains life-saving and first aid supplies that will help you and your family survive an emergency or any disaster. As the name of the package suggests, it is good for 4 persons and can last up to 72 hours, or 3 days. Ready America is a company that is known to supply survival and emergency preparedness commodities in many different countries. Its goal is to have families, businesses, and communities protected during an emergency or a calamity. Ready America is a company you can turn to for survival or emergency preparedness. 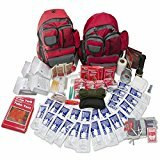 Ready America has produced a wide range of survival and emergency kits including the 70385 Deluxe Emergency Kit 4 Person Backpack. This backpack will help a small family with 4 members survive a calamity or any type of emergency. The packages they offer include the necessities most needed during a disaster. The contents will last for 3 days until you can get help from the government or the appropriate agencies. 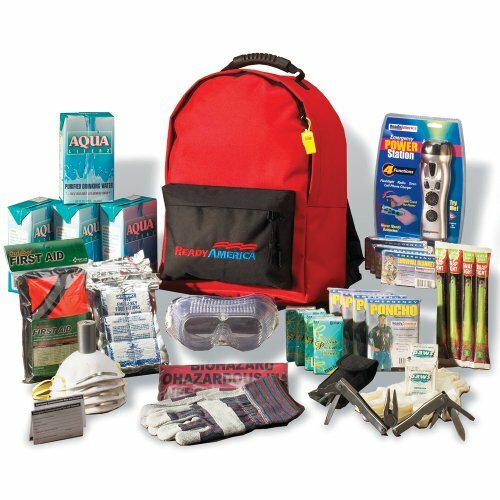 A disasters or emergency can happen when we least expect it, so it is important to be ready always by having one of Ready America’s emergency packages such as the 70385 Deluxe Emergency Kit 4 Person Backpack. A bug out bag backpack is like a regular backpack, but it is used to stock supplies that are required for survival during a disaster. A bug out bag is not a survival kit; the difference is with the contents. For a bug out bag, the supplies are normally for a short-term evacuation lasting up to 72 hours or 3 days. Thus, it is also referred to as the 72-hour kit. A survival kit, on the other hand, contains items that are meant to last longer than 72 hours. The two, however, are not different from each other as both are used for survival in case of a disaster or any emergency situations. It is important for an individual or families to get ready and have one of these kits for survival. In a critical situation, we do not know what is going to happen. We cannot measure the danger that will come with it. We will not know what the consequences are and we surely cannot control it. Hence, as mentioned earlier, proper planning is the answer to keeping yourself and your family safe before, during, or even after a disaster. We need to prepare for the worst and get ready for any type of disaster that could hit and the chaos that it will bring. During an emergency, it is expected that people will have to move fast to leave the area of danger or transfer to an identified evacuation area. A person or a family would not have enough time to pack before leaving the house or wherever they are. Time is of the essence during a disaster; hence, it is critical to have readily available emergency supplies that can easily be carried as you move from one place to another. Since a bug out bag is used for evacuation, it is important to have one that can be comfortably carried from one location to another. During a calamity, no one knows how big the impact could be. The roads can be inaccessible and this would mean that you and your family must walk to transfer to another location. No one can tell how long this walk would be. As such, it is important to keep the bug out bag portable; you must be comfortable in carrying it around until you get to a safe place. 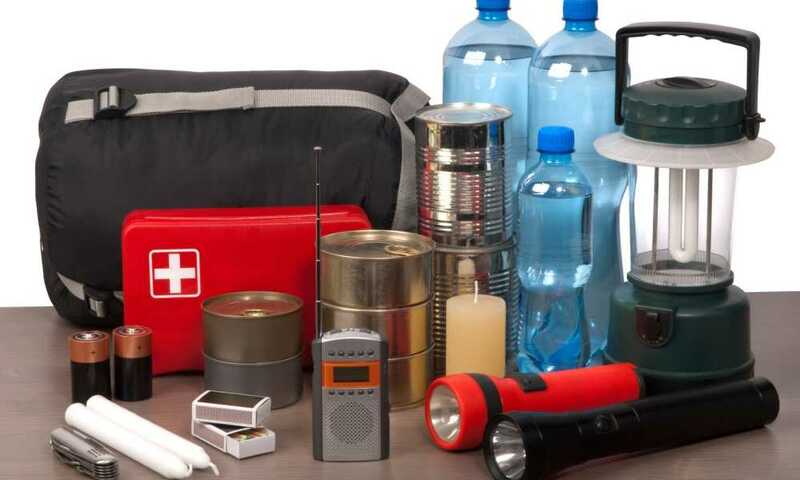 Because of the information presented above, it is critical to ensure that the bug out bag that you have has only the basic supplies or the most important items you will need to survive a disaster. You need to pack items that you cannot live without should a disaster strike. There are different types of bug out bags depending on the items that are stored in them. In this article, we will review 3 of the most common bug out bags. Below is a description of each bug out bag and what it can do during an emergency. This type of bug out bag should provide individuals or families with the important emergency supplies as an alternative in times when you do not have the “get home” type of bug out bag or the 72-hour bug out bag, which are known to have more comprehensive contents. Basically, this everyday kit should allow you to survive a certain situation on a short-term basis until you get access to a more comprehensive emergency kit or reach a safer location. 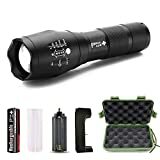 Typically, the items that should make up an emergency kit or gear are survival supplies and tools such as a neck chain knife, a tactical pen, mini survival kit, keychain LED light, and the like. The items identified that must be included in an emergency kit should be stored or secured along the daily items you use such as your clothing, purse, office bags, jacket, pockets, keychain, and others. The idea is to ensure that you are ready anytime, anywhere. Keep in mind that we cannot identify when a disaster will strike. As such, it is critical that you have these emergency kit items with you whenever and wherever you go. 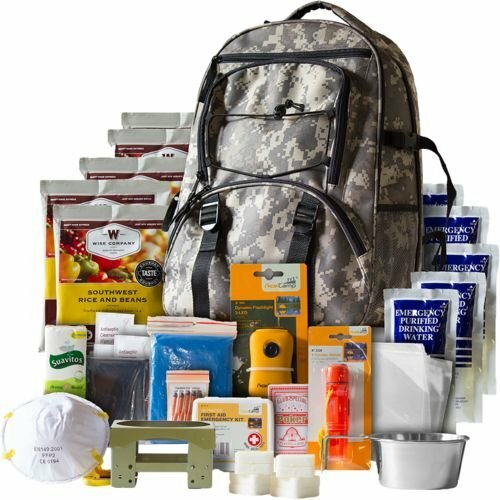 This bug out bag can be confused with the 72-hour bug out bag; both are used interchangeably, but based on the concept, a get home bug out bag is helpful when a disaster or emergency happens during the day or at night while you are away from home. Normally, this type of bug out bag is left at work, at school, inside a car, or in a safe location such as your drawer at work, or a locker. It should be near you and you should immediately be able to grab it in case there is a need to do so. Keep in mind that during a disaster, time is very important. Any delay can cost you your life, so you must move as quickly as possible. Like the first type of bug out bag, it should contain everything you need to survive until you reach a safer location. 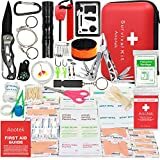 In short, the supplies should last from the time you have been evacuated until the time you have reached a safe site, at which point you should have a more comprehensive supply kit for your survival in the next few days. Because of this, keeping the bag light and comfortable to carry is critical in ensuring your survival. For most people, this is considered the most widely known bug out bag. This is the type of bag that you should bring if you have received proper notice while you are at home that an evacuation is necessary due to a disaster. 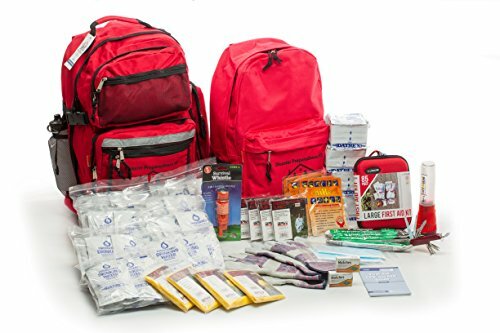 Basically, this bag or kit includes the most basic and the most important supplies that will let you and your family, if you have a small one, survive and safely and comfortably get to your evacuation site. As such, a 72-hour or 3-day bug out bag is not a tactical bag, which is what you need if you are in a battle or any military exercise. Because of its contents, this bug out bag is known to carry the most important items in terms of emergency preparedness and survival. The contents are expected to provide you, and hopefully others who are with you, with a source of emergency supplies for the next 72 hours. This type of bug out bag is normally stored at home. It must be regularly checked and monitored to ensure that the items inside it are consumed or replaced before their expiry dates. In this review guide, we selected what are for us the best premade bug out bags available for sale on the market. In our opinion, you can't go wrong with any of the bags mentioned above. They are all good options if you want the convenience of having a ready to go, pre-packed bug out bag backpack, assembled by experts on preparedness, that will cover your most basic survival needs. With that being said, our choice for the best pre-packed bug out bag is the Emergency Zone 840-2 Urban Survival Bug Out Bag Emergency Disaster Kit​. For its convenience and affordability, you won't regret picking this one. So make sure you are prepared and be safe.